When it comes to the increasing scapegoating that says video games cause mass shootings, game-makers haven't had a whole lot to say in their chosen medium. Most video game companies and their representatives seem to be choosing to stay away from a debate in the court of public opinion, operating maybe on the principle that they may get outmaneuvered in the land of soundbites and pop punditry. But Molleindustria isn't most game companies. And the man behind the indie agit-prop dev studio may have outmaneuvered the NRA and the gun lobby's political allies with a bite-sized game that shows how more guns don't necessarily make anyone safer. The Best Amendment is a satirical game about how guns make you the good guy. It's also a game about how guns make the same you a bad guy, too. 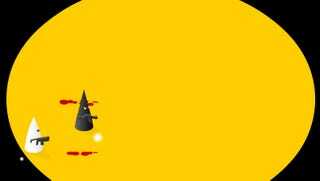 Simple controls—WASD to move and mouse-clicks to shoot—let you pursue the game's only goal, which is to collect stars. Things get tricky when you start having to dodge the bullets of other gun-toting characters, who are actually your ghosts tracing the paths you previously made. Sure, you get bigger better weapons as you go but they're no match for the sheer number of past selves you'll face up against. As you play Best Amendment and inevitably die, the words of NRA CEO Wayne LaPierre flash onscreen. "The only thing that stops a bad guy with a gun is a good guy with a gun." But that assertion doesn't hold up in a game filled with guns. The implicit argument embedded in the game is that the only way to stop gun violence is to not pick up a gun at all and/or to stop access to guns. Now, Paolo Pedercini—the man behind Molleindustria—leans way to the left in terms of his personal and professional politics. He's made games about the futility of trying to control information in the era of Wikileaks, the soul-crushing nature of working for big corporations and the messy business of being a unmanned drone pilot. Any accusatory claim of bias on his part would likely be answered with "guilty as charged." All Molleindustria games try to force players to re-think what they take for granted about the politics that circumscribe their lives. Still, the most important thing about Best Amendment is that it's a video game that rebuts some of the harshest criticisms being thrown at the medium right now. It's a playable put-down of the people who would shift blame for tragedies like the Newtown massacre onto entertainment companies and not weapons manufacturers. Whether you agree with the game's stance or not, it's still a damn good thing that it—as a piece art that doesn't shy away from political realities—exists at all.